It’s a stencil, called «Dedicate Balance » , made by Shepard Fairey known as OBEY who is a well-known street artist. It was painted in June, 2016 for the CP 21 (Conference of Parties, COP 21 in French), and it is at 60 Jeanne d’Arc street, in Paris 13e. First OBEY did a globe under the Eiffel Tower and then he put the globe’s scene on a wall. We can see a blue mandala which represents different scenes about ecology. In the centre, there is the Earth because all the ecology problems have an impact on our planet. 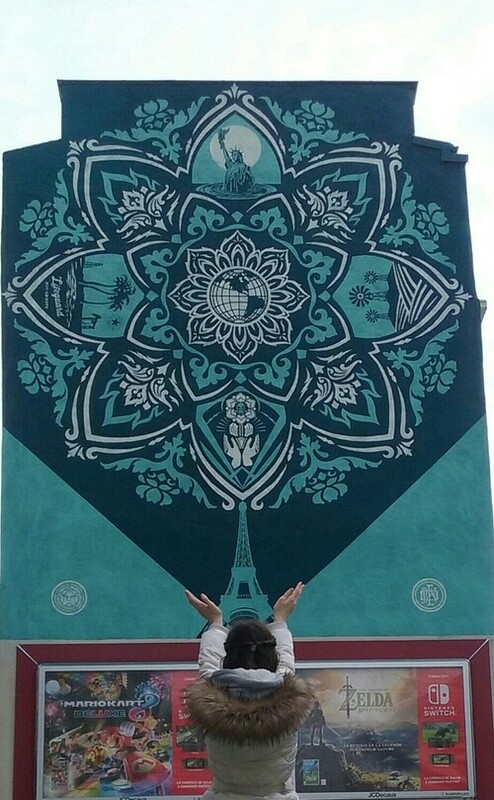 The Eiffel tower carries the mandala because the CP 21 was in Paris, and it’s very important for ecology and environment. A human carries the stencil to show that the ecology depends on the actions of all humans and everybody is concerned by this problem. It’s beautiful, striking and interesting.